The great contribution of this book is that it opens a window to cooperative strategy in our current business reality while offering a powerful synthesis of validated wisdom. Written by acknowledged experts, this book provides perhaps the most comprehensive coverage of the domain of inter-firm cooperation. The presentation is scholarly, yet accessible to thinking consultants and practitioners. 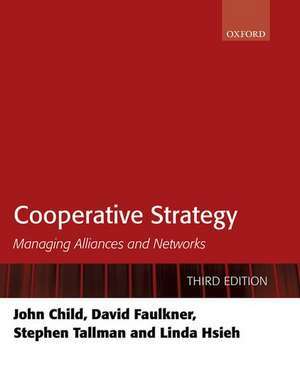 This impressive and expansive volume brings together the most important thinking on alliances and networks, and it will be important reading for those who have devoted their careers to cooperative strategy as well as those who are new to this exciting area. If you are going to read only one book on strategic alliances, this should be it. John Child is Professor of Commerce at the University of Birmingham. In 2006 he was elected a Fellow of the British Academy. He is also a Fellow of the Academy of International Business, the Academy of Management and the British Academy of Management. He has authored papers in international journals as well as 24 books, including Corporate Co-evolution with Suzana Rodrigues, which won the 2009 Terry Book Award of the Academy of Management. His currentinterests focus on hierarchy in organizations and society, cooperative strategy, and the internationalization of SMEs.David Faulkner is an economist who spent much of his early career as a strategic management consultant with McKinsey and Arthur.D.Little. He is Professor Emeritus of Strategy at Royal Holloway, University of London, and was formerly Visiting Research Professor at The Open University. Until 2003 he was Tutorial Fellow at Christ Church, Oxford and Member of the Governing Body, and an Oxford University Lecturer in Management Studies (Strategic Management). He has had published or edited fourteenbooks on co-operative strategy, mergers and acquisitions, and international business. He is currently Dean and Founder of Magna Carta College, Oxford, a private business college.Stephen Tallman is the E. Claiborne Robins Distinguished Professor of Business at the University of Richmond. His research interests include global strategic management, geographic clusters, organizational knowledge and learning, and alliance strategies. He chaired the International Management Division of the Academy of Management and founded and chaired the Global Strategy Interest Group of the Strategic Management Society. He is the founding editor and past co-editor of Global StrategyJournal and was an associate editor for Strategic Management Journal. He is a Fellow of the Academy of International Business and of the Strategic Management Society.Linda Hsieh is a Reader (Associate Professor) in International Business at the University of Birmingham, having previously worked at SOAS University of London. Her main research interests include decision-making, internationalization of firms, and management of international strategic alliances. Her research has been funded by the British Academy/Leverhulme Trust. She has published in the Journal of World Business, International Business Review, Journal of International Management,Management International Review, R&D Management, and Technological Forecasting and Social Change.